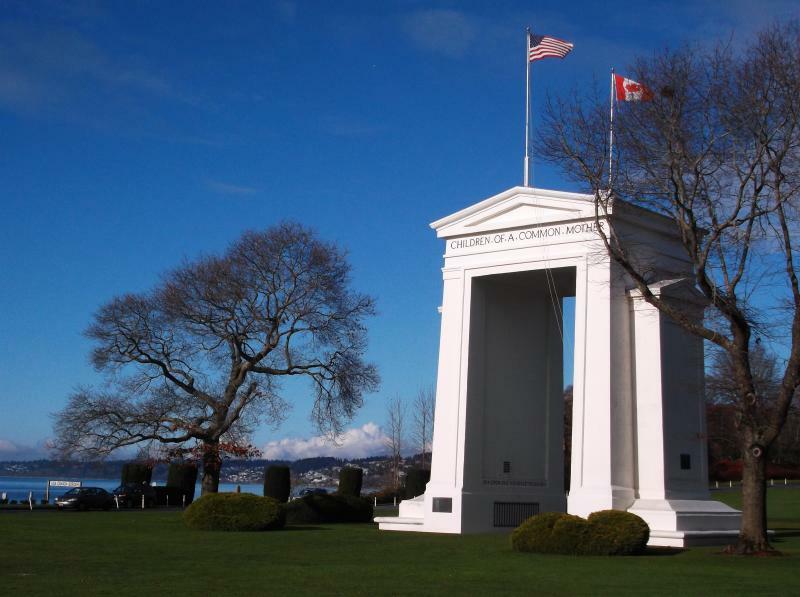 In the southernmost section of Surrey, near the shores of Semiahmoo Bay, a 67’ white monument known as the Peace Arch watches over travellers between the United States and Canada. This is one of Canada’s major border crossings and joins Highway 99 with Interstate 5 in Washington. To get a closer look at this structure, head to the aptly named Peace Arch Park in South Surrey, park your car, and walk the rest of the way. Most people don’t realize there are two different parts of the park with two different names. Peace Arch Provincial Park is in British Columbia, Canada, and International Peace Arch Park is where the monuments are located on the 49th Parallel. The Peace Arch was completed in 1921 on a section of land between the south and north bound highways. The park has been creatively landscaped with trees, shrubs, flowers, and a well-manicured lawn. It’s a nice place to go for a walk and admire the scenery, but the big attraction is the Peace Arch. On the Canadian side of the Peace Arch an inscription reads: “Brethren dwelling together in unity”. On the American side the inscription reads: “Children of a common mother”. On each side of the arch’s interior, gates have been permanently attached with a plaque that reads: “May these gates never be closed”. As far back as I can remember the gates were chained and padlocked to the monument otherwise people would be closing them all the time as a big joke! A plaque dedicated to the builder, Samuel Hill, commemorating his devotion to worldwide peace, unity, and good will can also be seen inside the arch. Near the Peace Arch is an international boundary marker on the 49th parallel. Visitors can stand with one leg in Canada and the other leg in the United States. A few steps away a monument commemorates the 150 years of friendship between Canada and the United States, signed by President Lyndon Johnson and Prime Minister Lester Pearson to the continued good will and peace between the two countries. Visitors to the Peace Arch do not need to cross customs, report to a border guard, or show a passport. It is okay to go back and forth from Canada to America while walking around the Peace Arch and the gardens. Stay within the confines of the park and don’t keep walking south into Washington unless checking in with immigration at the border crossing. A few people have made a last minute decision to walk into Blaine to have lunch only to have an unhappy border patrol agent show up at the restaurant. Peace Arch Park is located off Beach Road in South Surrey, accessed from Highway 99 South. Get in the right hand lane of traffic and turn at the sign for the Peace Arch Park near the duty free shop. If you go too far you’ll end up in the traffic heading south to Washington. Likewise if you drive to the end of Beach Road you’ve gone about a kilometre too far. There’s a large parking lot, a picnic area, and washrooms. On holiday weekends and during the summer there might be lengthy delays for the border crossing, backing up past the 8th Avenue exit on Highway 99.